The mixed covenant culture found in the church world has brought a wide variety of confusion among believers in Christ. As Gentiles who had come to faith in the early church, what were they instructed by the lovers of the law from the Jerusalem church who still believed the law was in effect? Even those elders shared that Gentiles were not to be troubled with keeping the law. 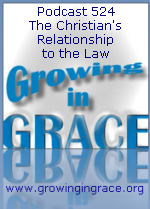 What we fail to realize is there was no list of old rules given to the church from the law, because in Christ we have no relationship to that law from the former covenant because it was replaced with God's Spirit in us.